● 1pc Battery Selector Switch. Perfect for marine,RV,campers,industrial etc. ● 4 switch positions including OFF / 1 / 2 / BOTH positions. ● Switch Position: 4 ( 1 - 2- Both - Off). ● Large range of Bronze screws for battery connection. 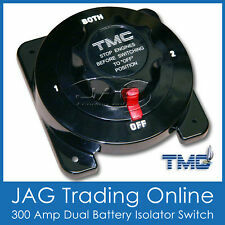 TMC Dual battery Isolator Kill Switch Boat Car Caravan 4WD 4X4. 1 X TMC Dual Battery switch. Boat fit-out. Inflatable Boat Accessories. Once your motor is warm and will start first crank. You stop your engine Turn the switch toboth. ● 1pc Battery Selector Switch. ● 4 switch positions including OFF / 1 / 2 / BOTH positions. Perfect for marine,RV,campers,industrial etc. Disconnects the battery safely to eliminate any power draw when the boat or vehicle is not in use. 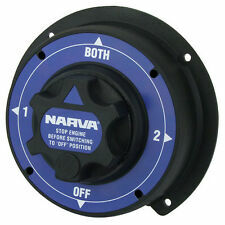 Narva Dual Battery Master Switch- 61090. 4 position switch battery 1/battery 2/ both/ all off. Also Suited for Solar Changeover Battery Switch. Vapour proof housing. HEIGHT: 160mm. 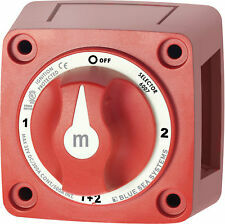 Marine Dual Battery Selector Switch. ● 1pc Battery Selector Switch. Perfect for marine,RV,campers,industrial etc. ● 4 switch positions including OFF / 1 / 2 / BOTH positions. ● Switch Position: 4 ( 1 - 2- Both - Off). 1 x Selector Switch. It is suitable for professional racing cars, boat, yachts and RV, etc. Double battery switch match your needs better. Three gear rotary switch. Due to the difference between different monitors, the picture may not reflect the actual color of the item. NOTE: These battery isolator switches are a genuine SEAFLO quality product - Don't settle for inferior products on the market. 1 xExtra Heavy DutyDual Battery Isolator Switch. 3-Position, 6~32V DC - A must for every Boat & Caravan! 3-position (Battery 1/Off/Battery 2) LED illuminated rocker switch with rubber seal. Green LED indicator on top position when "Battery 1" is selected, Green LED indicator on bottom position when "Battery 2" is selected. Battery selector switch - 1, 2, both or off positions. LED Lights 12 Volt. Suitable for 12 or 24 Volt. Vapour proof housing. Add to favourite. LED Underwater Lights. Caravan accessories. Access Hatches. 4 position battery switch battery 1 / battery 2 / both / off. Heavy Duty Dual Battery Switch. Vapour proof housing. Volts: 12V/24V. HEIGHT: 135mm. Dual Battery Selector Switch 12V - Orange - Boat Caravan Car 4WD 4X4. Boat fit-out. Selector Switch. Inflatable Boat Accessories. Once your motor is warm and will start first crank, you stop your engine, turn the switch toboth. Model # 6007 Series. Hi Performance Battery Bank Selector Switch. Selector 4 Position. Switch Type. Switch Positions. Battery Combine. Battery Inputs. · Case design allows surface or rear panel mounting. 1 xExtra Heavy DutyDual Battery Isolator Switch. NOTE: These battery isolator switches are a genuine quality product - Don't settle for inferior products on the market. Can be used with 6V up to 32V systems to isolate and secure the electrical system. Battery Master Switch 3 Position On, 1, 2 Both ( Dual Battery). 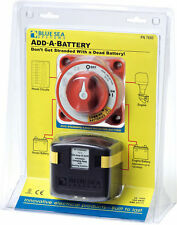 Used for Boats, Marine, Caravans, RV's and 4 x 4's to switch from one to 2 batteries. Compact size 140mm x 140mm x 83mmCan be installed vertically or horizontally. 12/24v Battery Isolator / Selector Switch. 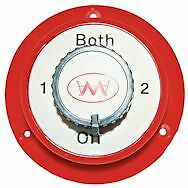 This switch has 1, 2, both or off positions allowing you to select which batteries to utilize. Suitable for marine applications as the housing is vapor-proof. 1 x Dual Battery Isolator Switch. 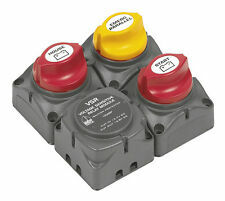 NOTE: These battery isolator switches are a genuine quality product - Don't settle for inferior products on the market. A must for every Boat & Caravan! For 12V - 24V. Isolates 1 battery or 2 batteries, or links up both batteries in parallel. Marine Pump. Marine Gauge & Sensor. Rocker Switch & Panel. Marine Hardware. Marine Steering System. Marine Lights. Engine Parts. 1 xExtra Heavy DutyDual Battery Isolator Switch. 2-Position, 6~32V DC - A must for every Boat & Caravan! Can be used with 6V up to 32V systems to isolate and secure the electrical system. Disconnects the battery/batteries safely, to eliminate any power draw from the battery when vehicle or boat are not in use. Selector 4 Position: 1-2-Both-Off. 1 Battery Selector Switch. Selector switches will not separate electronics from harmful engine starting spikes. Our goal is to provide you with high quality products and services. The (714-140A-DVSR) uses a dual sensing DVSR (710-140A). BEP Battery Switch & VSR. 1 x BEP Battery Switch & VSR. Battery Distribution Cluster features. for Single Engine with Two Battery Banks. For use with two battery banks. 1 xExtra Heavy DutyDual Battery Isolator Switch. NOTE: These battery isolator switches are a genuine quality product - Don't settle for inferior products on the market. A must for every Boat & Caravan! Dual Battery Switch - Locking Key - Grey High Quality - 4 Position Boat Caravan Truck 4X4 4WD. Outboard Propeller Guards. Boat fit-out. Inflatable Boat Accessories. 1 X GREY Dual Battery switch with Locking Key. Boat fit-out. Inflatable Boat Accessories. Once your motor is warm and will start first crank, you stop your engine, turn the switch toboth, and restart your engine (never turn the switch while your running your engine). Caravan accessories. Caravan Accessories. Marine RV Caravan Battery Test Switch Panel. LED Lights 12 Volt. Deck Fillers. Battery Test Switch. Black Anodised Aluminium Panel With Illuminated 3 Way Rocker Switch. Remove the key to isolate and secure the electrical system. Designed for a master disconnect switch. Continuous switch, on/off/on/off. 240 amp at 12V continuous. 120 amp at 24V continuous. Removable key at the nominated off position. Isolates 1 battery or 2 batteries, or links up both batteries in parallel. Blue Sea Systems #7650 "Add A Battery" Solenoid Battery Isolator Dual Circuit System. Blue Sea System #7650 "Add a Battery" system is designed to automate charging of two battery banks while still keeping one bank in reserve for engine starting. 1 Piece Battery Selector Switch. 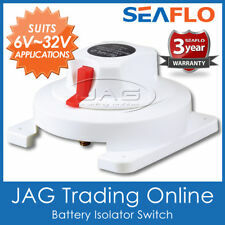 - Dual Battery Switch -Isolator Kill Switch Marine Boat RV Battery. - Battery 1, Battery 2, Both, or Off positions. 4.3-position (Battery 1/Off/Battery 2) LED illuminated rocker switch with rubber seal. Suitable for a variety of applications including: Marine cockpits, caravan applications, trucks, 4x4s and RV's. LED indicator on top position when "Battery 1" is selected, LED indicator on bottom position when "Battery 2" is selected. Specifications for 6011200 m Series Mini Dual Circuit Plus Battery Switch - Simultaneously switches two isolated battery banks or combines battery banks to all loads. Tin-plated copper studs for maximum conductivity and corrosion resistance. 5511e DUAL CIRCUIT PLUS BATTERY SWITCH. The Dual Circuit™ Battery Switch simplifies multi-bank battery switching with a single ON/OFF switch. It eliminates the confusion surrounding the traditional four-position selector battery switch. 3-position (Battery 1/Off/Battery 2) LED illuminated rocker switch with rubber seal. - Blue LED indicator on top position when "Battery 1" is selected, Green LED indicator on bottom position when "Battery 2" is selected. 4.3-position (Battery 1/Off/Battery 2) LED illuminated rocker switch with rubber seal. LED indicator on top position when "Battery 1" is selected, LED indicator on bottom position when "Battery 2" is selected. Battery Selector Switch - Extra Heavy Duty. Battery Selector Switch. 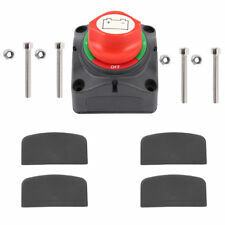 1 x Battery Selector Switch (Heavy Duty). - 350 amp continuous. © 2019 Boat Hardware. In the unlikely event of a problem we will always do our utmost to rectify your issue. 3-position (Battery 1/Off/Battery 2) LED illuminated rocker switch with rubber seal. - Blue LED indicator on top position when "Battery 1" is selected, Blue LED indicator on bottom position when "Battery 2" is selected. Black finished aluminium panel with simple colour coded gauge. Illuminated rocker switch selects test condition of battery one or two. Suits 12 volt. BEP Mini Battery Selector Switch. Four position rotating switch to provide OFF, BATTERY 1, BOTH and BATTERY 2. 5mm round head mount holes. Removable side plate to provide access for heavy duty battery cable. For marine, caravan, automotive, 4X4 applications. Perfect for testing the conidtion of your batteries. This switch can be used in a dual battery or single battery set-up. 3 position rocker switch. If your boat has just the one battery it can be a good idea to invest in a second. Having a spare gives you more flexibility, as well as a back-up option in case one fails or you accidentally drain it. Cars and other motor vehicles might be fine with just their one battery, but when a car runs out of juice you might just need a tow. When you’re out on the water without boat navigation lights, things can get outright dangerous depending on where you are and what the weather is like. And of course, having a second battery just straight up gives you more battery capacity. With a dual battery switch you can select one battery, the other, both or neither. It’s an essential part of taking advantage of a two-battery set-up. Boats need electrics for a lot of the same things that other vehicles do: lighting, starting the engine, and powering anything else integrated into the boat itself. For that reason it’s often a good idea to have navigation and radio equipment with its own, rechargeable battery. Of course, making several different electrics run off one (or two) batteries requires some additional set-up to make everything work. You’ll need all sorts of electrical and lighting equipment for boats to go along with the dual battery switch. Besides selecting the battery, you’ll probably also want to be able to control output to specific sub-systems. With electrical marine toggle switches you can turn on and off power to specific parts of your boat and often they’ll come with multiple labels so you can decide what each switch should do. When selecting a dual battery switch, the first and most important thing to look for is that it’s actually a dual battery switch and not just an on/off switch. You’ll also need to make sure that the switch can handle the amperage required for the boat’s start-up sequence and when you’re installing the batteries you’ll need to make sure there’s not too much voltage drop to any part of the boat.